Mike Missanelli talking sports on his 97.5 The Fanatic afternoon drive show. Televised sports-radio shows have become an increasingly popular format in various markets both nationally and locally. There are good reasons for this, despite the fact that it's not very visually captivating to watch people talk about sports. For one, it's easy to mash these shows up into topic-driven clips, post them on YouTube and turn them into an additional revenue stream. The hosts are often popular enough to be in demand for low-budget television slots that can admirably hold an audience, too. Around 2 p.m. on Friday, viewers of NBC Sports Philadelphia witnessed one of the drawbacks of radio television. 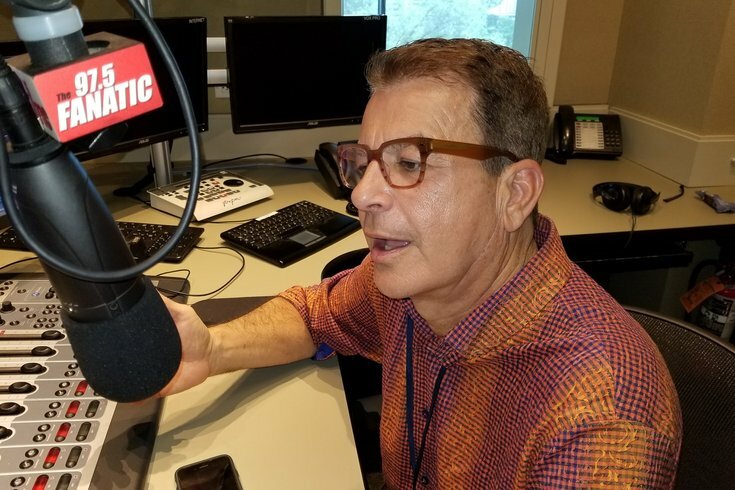 At the start of Mike Missanelli's show on 97.5 The Fanatic — broadcast on NBC Sports Philadelphia as "The Mike Missanelli Show" — the host was captured tearing into producer Tyrone Johnson. Based on that clip, you can't really tell what the disagreement is about, but it's pretty clear Johnson isn't willing to take the blame for it. Co-producer Natalie Egenolf looks somewhere between irked and embarrassed for them as the argument continues. The worst part about this snafu is that, in the midst of an apology, Missanelli admits that he had no idea they were live when the argument was unfolding. Johnson and Egenolf appeared to have been painfully aware. We don't know definitively what led to this breakdown. An anonymous source told PhillyVoice it was driven by Missanelli's frustration over losing out on an interview opportunity with Sixers head coach Brett Brown, who appeared earlier Friday on 97.5 The Fanatic and then later on rival station SportsRadio 94WIP. Missanelli ultimately tried to be diplomatic. “I think that everyone involved in what’s gone on today at this radio station is involved," Missanelli said. The weekend can't get here fast enough.